Dawn Barker's debut novel of 2013, Fractured, was a breakaway hit, beloved by book clubs and reluctant readers alike. Naturally, there is a lot of excitement surrounding the release of her follow up, Let Her Go. Like Fractured, Let Her Go explores a complicated moral and psychological grey area from multiple perspectives, allowing the reader to decide who they are in agreement with. The book follows two step sisters, Zoe and Nadia, as they negotiate the emotional battlefield of a surrogate pregnancy. When Zoe discovers that, due to lingering health issues, she is unable to conceive a child of her own, she is upset, and confides in her step sister Nadia who has three children of her own. To Zoe, Nadia has the perfect life, although Nadia would not be so quick to agree with her. Nadia's husband is often busy with work, and uninvolved with the children, though I would not go so far as to classify him as neglectful or uncaring. Nadia decides to offer up herself as a surrogate for Zoe's baby, despite the misgivings of both her own husband and Zoe's. The baby is conceived, using Nadia's egg and Zoe's husband Lachlan's sperm, and everything seems set to be perfect for all involved... or is it? Barker's skill as a writer is her ability to develop realistic plots based on complicated issues. She does this with sensitivity and a balanced understanding of the situation from many points of view. Her characterisation of Zoe is most striking; Zoe is the slightly overweight one, always comparing herself to her older, more perfect step sister, who feels intensely lonely when her husband is away working in the Kalgoorlie superpits. At times, Zoe can be grating to read, as she seems to feel like the world is out to get her, but this adds to the development of the plot as she is forced to go back to work when Lachlan quits his job, and then discovers that Nadia is muscling in on her family. I admit that Zoe's feelings about the situation led me to believe that something much more sinister would happen. In the sections told from Louise's point of view, the mother and father are never named, and I thought perhaps in the end it would turn out to be Lachlan and Nadia who ended up together, united by their conception of this child. Nadia was an interesting and sometimes frustrating character. She is the easiest to like because she is so normal and independent, but could at times be contradictory. While she was fierce in her love for Louise, her thoughts only turned to her own children when it was convenient for the plot. I would have liked to have seen her interact more with them. The choice to involve Louise as a teenager in this book added an edge to the narrative that moved it from psychological drama to something deeper. Barker's understanding of the teenager in rebellion made Louise's voice compelling and also leant sympathy to her feelings. I particularly related to her plight in being dragged along to family counselling, and her fear of missing out when it came to schoolies week on Rottnest. Let Her Go is poised to become every bit as popular as Fractured, and for good reason. It is well thought out, well plotted, well paced and most of all, it is well written. This is like Jodi Picoult with a soul, written not from a formula but from the heart. Great review, Em. Looking forward to its release! 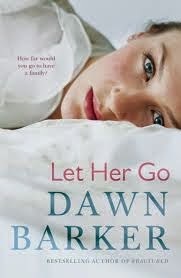 And well done to Dawn on writing a second book that's as good as her first!